In 1958, the first issue of a new magazine named Jazz Review contained an essay by musicologist Gunther Schuller, titled “Sonny Rollins and Thematic Improvisation”. The piece’s premise was simple – to examine a single Rollins' solo on a recording called Blue 7 (heard on the saxophonist’s iconic 1956 LP Saxophone Colossus), whose title gave away the basic structure of the performance – that of the back-bone of jazz, the twelve bar blues. Rollins was already one of the most talked-of jazzmen of his generation, seen by many as a genuine heir to Bebop's founding father Charlie Parker, but Schuller's painstaking analysis elevated him further still, to the rank of innovator whose blues improvisations had a level of compositional cogency of one “who spends days or weeks writing a given passage”. Rollins, Schuller believed, had provided a defining example of the art of jazz. Yet, like all good critics, he was aware that such a performance didn't come out of nowhere. Although Blue 7 was undoubtedly a high spot, it was a peak that dominated a landscape littered with other such achievements. Indeed, it was just the latest in a series of classic blues solos Rollins had been setting down on record with his own groups and those led by others since the early 1950s. 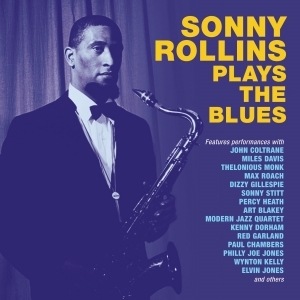 This new collection collates a selection of those great performances – the first ever issue to concentrate solely on Rollins; blues specialist. Well-regarded for his musical wit and penchant for oddball song choices, since Blue 7 remarkably little has been written about the great saxophonist’s ability to wring pure invention from the most fundamental format in jazz, yet the blues (part of his artistic DNA since his days as a teenage Louis Jordan fan) has been at the back of all Rollins' stylistic shifts over a sixty year career. Packaged with period photographs and a fascinating booklet note by saxophonist Simon Spillett, this anthology charts a course through some of his greatest musical encounters – with other giants like Dizzy, Miles, Coltrane and Monk – as well as documenting his never-ending quest for the most stimulating of instrumental contexts. There are pianoless trios, a series of classy quartets and quintets and one especially memorable session, a two-piano sextet. Whatever the setting though, and whatever the tempo (which ranges from a roar through Sonnymoon For Two to the slow purr of Sumphin'), this is Sonny Rollins proving time and again that the blues is at the very core of his immense contribution to the music.